There is no doubt that New York is in the grips of a poké craze at the moment, and not the Pokémon one. Or maybe in addition to the Pokémon one. 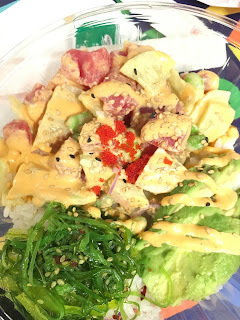 Poké in this sense is the Hawaiian answer to ceviche, raw fish that's been marinated in soy and usually citrus, and often mixed with some seaweed, sesame seeds, or other flavorings. In my native land, you can get it by the pound at the deli counter at supermarkets, and it's usually eaten straight, as-is. In the current NYC Poké craze, it's most often served in a bowl over rice, sometimes with other ingredients. Sort of like chirashi-zushi. It's a great idea, and the better places, in addition to having impeccably fresh fish, devise bright and interesting combinations of flavors and textures. As a self-proclaimed poké expert, it's odd that I haven't sought out any of the city's poké options yet, but it's true. Today however, I found myself at the new, subterranean TurnStyle development at the 59th street subway station, and Yong Kang Street there offered them, so why not? My initial verdict, with a single bowl under my belt, is it's not terribly authentic as a dish. That is, I certainly never had anything quite like it as a kid. But the flavors separately do remind me of home, and they go well together. I like TurnStyle, too, by the way, though I've only eaten there twice. When I've been there with other people, they say it feels un-NYC to them, like it should be in Melbourne or Hong Kong or a European City. I think they mean it's clean, eclectic, well-designed, and compact? NYC developments don't often hit all of those. Hope it's successful, it's a model I hope gets emulated in other blank and underused spaces in the city.